Never heard of e-Sports? Not a big deal, but you might be interested in this rapidly growing industry providing many opportunities for many businesses. e-Sports is playing online video games on professional and competitive level. When back in the 80's - 90's they would be stereotyped as a "nerd" of "geek" with interests in video gaming at home, however that generation as well as the following ones are slowly but surely building their own community growing out as a whole industry into the mainstream worth of billions of dollars. As a result, e-Sports' revenue was estimated $252M in 2015 (Newzoo, 2015)! Why is it called e-Sports? Because there are many similarities between traditional sports and e-Sports. Both including training, professional players, coaches, managers, fans and supporters and a myriad event at stadiums where teams compete against each other in front of a live audience of millions of people. The prize money is massive considering $71M in 2015 globally (Newzoo, 2015). Most popular games within e-Sports are: League of Legends, DOTA 2, Counter Strike: GO and StarCraft II. In addition, these matches are streamed online (Twich, Youtube) to make the event available for everyone all over the world, which refers to spectating. The biggest regions in e-sports are: Korea, North-America, China and Europa. Firstly, the foundation of big e-sports tournaments lies in Europe, with ESL being one of the biggest organisations. Secondly, e-Sports is very big in Korea, some believe that's where it all started, with Starcraft. It was so big at one point that the National Champion would be a National Hero and still to this day you can see the importance of e-Sports in their society. Furthermore, China is one of the fastest growing and the most profitable regions because of the population size and viewers. Moreover, America has the most financial value in terms of sponsorships. Each region has their own events and tournaments and the best teams of each region will come down to the ultimate tournament where they play for the World Championship. As Newzoo (2016) publishes, the industry consist of: teams, publishers, events, leagues, brands and evidently, the consumers (viewers). To go further into League of Legends (LoL), TSM, Fnatic, SKT, RNG are a few of the most famous pro teams. Besides the rise, this industry is fascinating because of its own culture. They have their own norms, beliefs, values, "language" and symbols. Good sportsmanship is valued, as you often can see "gl hf" (good luck, have fun), or "gg wp" (good game, well played). Which also leads to a new type of consumers which provides many opportunities. 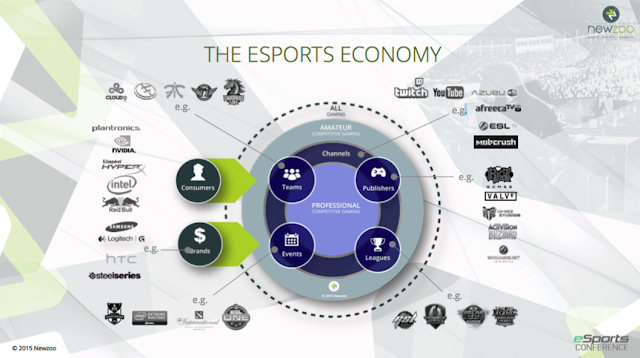 Consumers within the e-sports can be divided in players and viewers. Whereas it was a geeky thing to play video games in your room, it has become much more mainstream for young males but also females. According to Mindshare NA, 65% fans of e-sports are ages between 18-34, from which 38% are women. This is what I meant that whereas this group of people was the stereotype geek back in the days, now they all have grown up along with the hobby, resulting in a legit industry. Also , viewership is an aspect of the e-sports culture. The audience is made up of gamers. 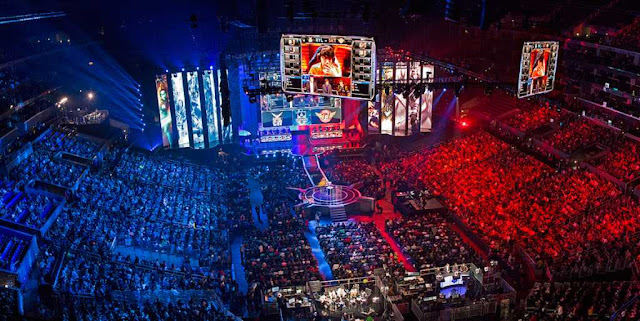 The finals of large tournaments reached to global audiences of around 30M on Twitch. 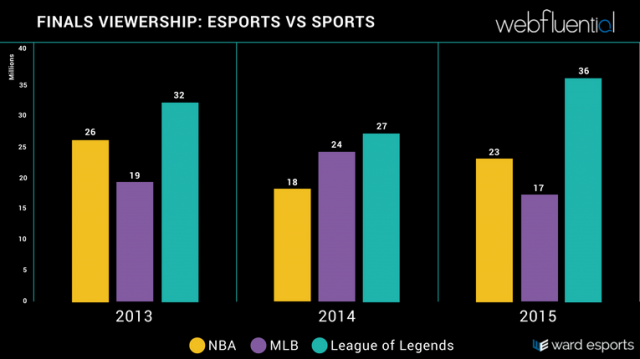 League of Legends attracted 36M viewers to the Twitch live stream during the Worlds 2015. e-Sports in a growing industry that has become even more populair compared to NBA and MLB. This is a true culture, because both players and viewers have a passion for e-sports and are true fans because of the deep social experience they gain. According to Mindshare (2016), almost half of e-Sports fans spend most of their free time on e-Sports. Moreover, 60% would like to travel to attend the favourite game, tournaments and players. The top pro-gamers are seen as celebrities and have their own fandom. There is no doubt that e-sports will only grow in the near future. With numbers like 36M viewers and $252M revenue, this developing industry can't be neglected and as a matter of fact, it is a huge market for many opportunities. Red Bull entered the e-sports through sponsorship in 2008 sponsering the 20-year-old Bjergsen of TSM which is an American League of Legends pro team. Through his influence and platform of 310k Facebook fans, 805k Twitter followers, 1,1M Twitch followers, 500k Youtube followers and 113k Instagram followers, Red Bull could be part of the industry and creates incredible brand awareness. However, there are some limitations to enter to enter e-Sports as a brand. For example Riot Games, has several regulations in order to protect the game and its industry. Brands can't be visible on screen for commercial purposes. Secondly, because it is still quite a niche market, not every brand can dip their toes in the market as it might clash or be controversial. There is still many research gaps in order to discover business opportunities, however this is certainly an industry that can't be neglected.